The third-generation M-Class sets a new benchmark in the SUV segment. The low fuel consumption figures and exemplary emissions figures are particularly impressive. Compared with the outgoing model, the entire model range consumes 25 percent less fuel on average. This kind of formidable reduction in fuel consumption is unprecedented with any Mercedes-Benz SUV model changeover to date. An ultra-modern engine line-up, concerted engine downsizing, the best-in-class Cd value of 0.32, extensive BlueEFFICIENCY measures and new development tools such as the "energy-transparent vehicle" all play their part in delivering the good energy efficiency figures. The highlight comes in the guise of the ML 250 BlueTEC 4MATIC, which is 28 percent more economical than its predecessor, boasts NEDC fuel consumption of 6.0 l/100 km (158 g CO2/km) and has a range of up to 1500 kilometres on a single tank – figures that only a few years ago remained the preserve of the compact class. In the ML 250 BlueTEC 4MATIC, the 3.0-litre V6 of the previous model is replaced by the thrifty four-cylinder EU6-standard unit already familiar from, for instance, the S-Class. The ML 350 BlueTEC 4MATIC features an extensively revamped 3.0-litre V6, which also betters the EU6 standard and offers far better performance coupled with a substantial reduction in fuel consumption. Thanks to state-of-the-art AdBlue® emission control technology both diesel models comfortably meet the EU6 standard slated for introduction in 2014. The 2.2-litre CDI engine turns the ML 250 BlueTEC 4MATIC into the most economical SUV in its class. With NEDC fuel consumption of 6.0 l/100 km, the model even outperforms any hybrid model currently offered by the competition. Despite the low fuel consumption figures, this M-Class model boasts maximum torque of 500 Nm at 1600 rpm and rated output of 150 kW (204 hp) with outstanding performance: the M-Class accelerates from 0 to 100 km/h in 9.0 seconds before going on to a top speed of 210 km/h. Two-stage turbocharging produces high torque even at low engine speeds. 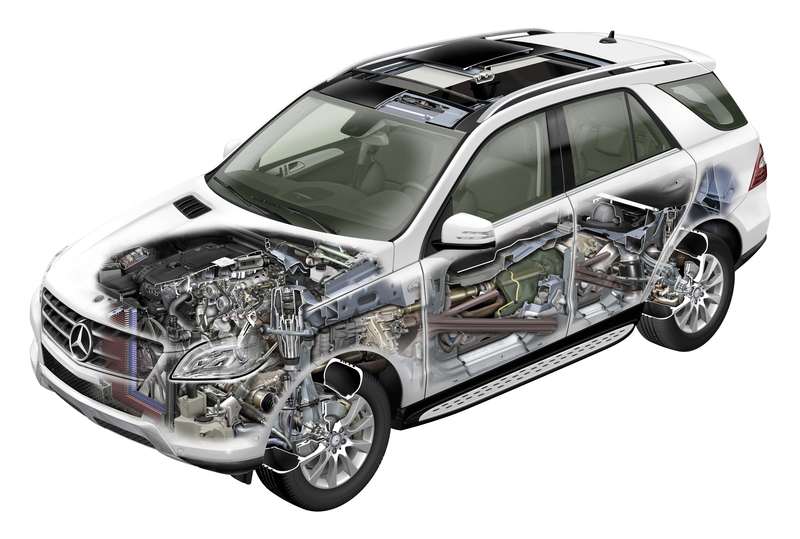 The compressor package – already fitted in the compact SUV GLK 250 CDI 4MATIC – made up of a small high pressure (HP) and a large low pressure (LP) turbocharger contributes decisively to the high output on a par with the 6 cylinder unit in the predecessor model ML 300 CDI BlueEFFICIENCY 4MATIC. The two turbochargers are connected in series, and each has a turbine and a compressor driven by this turbine. The HP turbine is located directly at the exhaust manifold and initially allows exhaust gas to flow through it; it then rotates at up to 215,000 revolutions per minute. The HP turbine housing features an integral bypass duct, which can be opened or closed by means of a charge-pressure control flap. If the flap is closed, the whole exhaust stream flows through the HP turbine, so that the exhaust-gas energy is available solely for the HP turbine drive. This means that the optimum charge pressure can be built up at low engine revs. The two compressors are likewise connected in series, and are in addition connected to a bypass duct. The combustion air from the air filter first flows through the low-pressure compressor, where it is compressed as a function of the LP turbine's output. This pre-compressed air then passes into the high-pressure compressor, which is coupled to the HP turbine, where it undergoes further compression. The result is a genuine two-stage turbocharging process. The major advantage of this sophisticated, demand-related control of the combustion air supply using two turbochargers is improved cylinder charging, and therefore high torque even at low engine speeds. Fuel consumption is also reduced. When the car is driven, this concept makes itself felt by harmonious driving characteristics with no turbo-lag, a favourable torque curve across the entire engine speed range, instant responsiveness and excellent performance. The V6 diesel engine in the ML 350 BlueTEC 4MATIC guarantees effortlessly superior traction. It develops 190 kW (258 hp) and impressive torque of 620 Nm. Despite its extraordinary performance this version boasts combined NEDC fuel consumption of 6.8 litres of diesel per 100 kilometres. The highly efficient V6 diesel unit delivers effortlessly superior performance: the ML 350 BlueTEC 4MATIC accelerates from standstill to 100 km/h in 7.4 seconds before moving on to a top speed of 224 km/h. While delivering performance on a par with the predecessor model, the ML 450 CDI 4MATIC with V8 diesel engine, the new unit, however, boasts 36 percent lower fuel consumption. 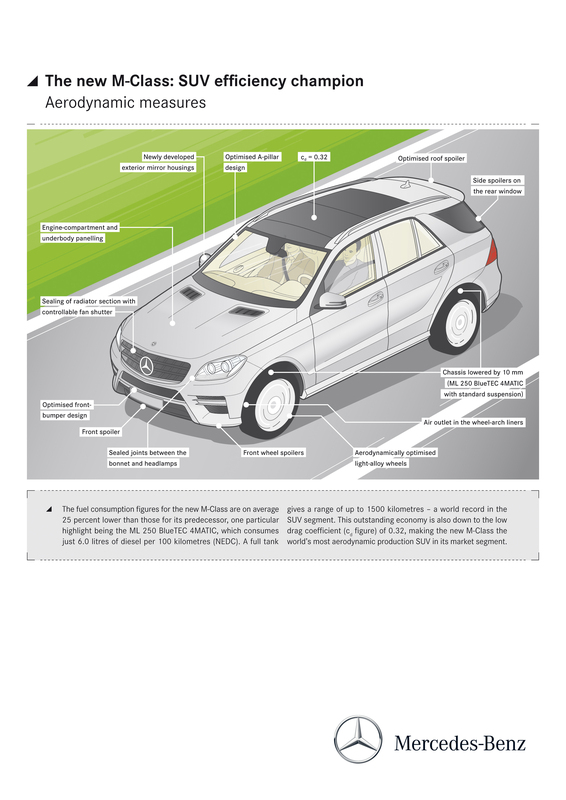 Just like the ML 250 BlueTEC 4MATIC, the ML 350 BlueTEC 4MATIC also ranks among the world's cleanest diesel models: BlueTEC is a technology developed by Mercedes-Benz to reduce emissions from diesel vehicles, especially nitrogen oxides. AdBlue®, an aqueous urea solution is injected into the exhaust gas stream as part of this process, releasing ammonia, which reduces up to 80 percent of the nitrogen oxides into harmless nitrogen and water in the downstream SCR (Selective Catalytic Reduction) catalytic converter. 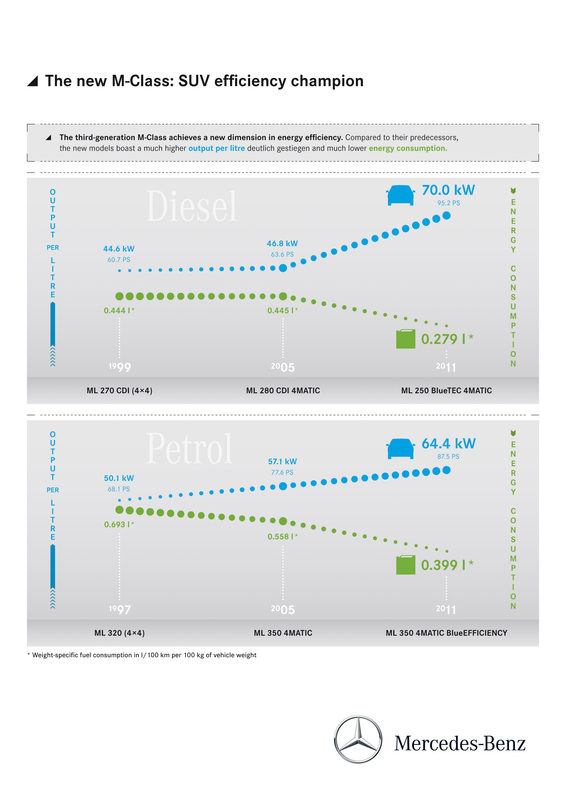 Upshot: both models already comply with the EU6 exhaust emissions standard due to be implemented in 2014. The AdBlue® tank is located under the luggage compartment floor to protect it in the event of a crash, has a capacity of 25.7 litres and is topped up every 25,000 kilometres at the regular service intervals. The filler opening is located behind the side fuel filler flap alongside the tank filler neck and is marked clearly with a luminous blue cap. This configuration allows the ML driver to top up the tank easily if they take full advantage of the off-road capabilities of the M-Class and are unable to find a service station off the beaten track. AdBlue® is available as a refill container from any Mercedes-Benz dealership; the instrument cluster provides a timely indication of the need to top up the tank. The ML 350 4MATIC BlueEFFICIENCY petrol-engined model features the groundbreaking technology of the new generation of V engines from Mercedes-Benz. 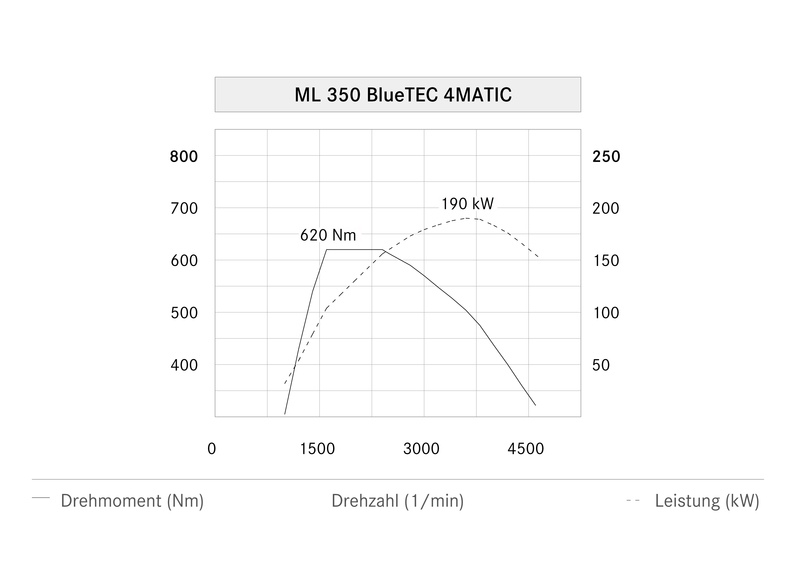 At the heart of the BlueDIRECT technology package lies the enhanced third-generation spray-guided direct petrol engine with piezo-electric injectors. In combination with multi-spark ignition, this technology offers further possibilities for fuel savings. The V6 engine in the ML 350 4MATIC BlueEFFICIENCY utilises a new stratified combustion process with a considerably extended characteristic map and fuel-efficient lean-burn technology ("homogeneous stratified mode"). As the name implies, HOS is a combination of homogeneous lean-burn and classic stratified combustion. The first injection is sprayed into the intake stroke, forming a homogeneous basic mixture. Actual "stratified" injection takes place during the compression stroke before ignition, and is a single or double injection depending on the characteristic map. The third-generation direct-injection system also features rapid multi-spark ignition (MSI). How it works: following the first spark discharge and a brief combustion period, the coil is rapidly recharged and a further spark is discharged. The MSI system enables up to four sparks to be discharged in rapid succession within one millisecond, creating a plasma with a larger spatial expansion than conventional ignition. Controlling this rapid multi-spark ignition enables both the time lapse before the next spark and the combustion duration for the relevant operating point to be optimally adjusted. This provides scope for optimising the centre of combustion and improving residual gas compatibility, especially during stratified charge operation. The ultra-modern 3.5-litre V6 unit has been designed as a naturally aspirated engine. As a major distinction from the preceding engine in the ML 350 4MATIC, the V-angle between the cylinder banks has been reduced from 90 degrees to 60 degrees. This has enabled the balancer shaft compensating primary vibrations to be omitted. As a result the driver notices an outstanding level of comfort. The design highlights of the 3.5-litre V6 include a completely new air intake and exhaust system in conjunction with a variable resonance intake manifold and optimised inflow and outflow. 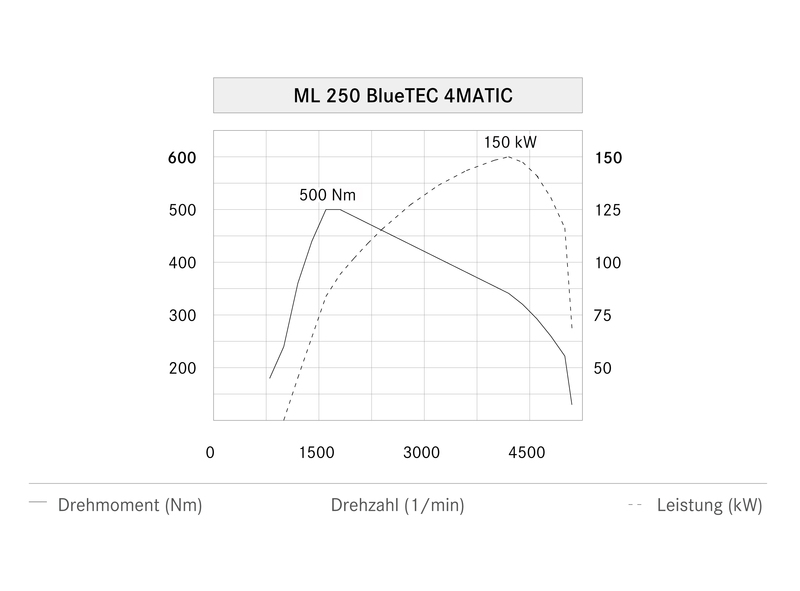 Result: with the same displacement, the output compared with the previous 200 kW (272 hp) model is increased by 12.5 percent to 225 kW (306 hp), while maximum torque has increased by 5.7 percent to 370 Nm (predecessor: 350 Nm) and now is available over a broader engine speed range from 3500 to 5250 rpm. In parallel with this substantial increase in power, Mercedes engineers have achieved an equally impressive reduction in fuel consumption. The predecessor's NEDC fuel consumption has been reduced by 25 percent. The new V6 petrol engine in the ML 350 4MATIC BlueEFFICIENCY consumes 8.5 litres per 100 kilometres, making it the most economical petrol model in its class. The model combines excellent consumption figures with dynamic performance, accelerating from standstill to 100 km/h in 7.6 seconds, and with a top speed of 240 km/h. 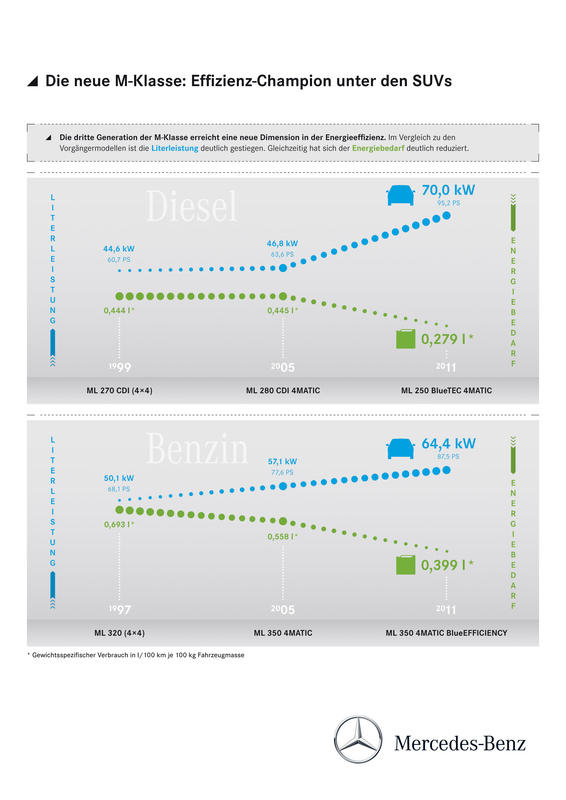 The performance of the M-Class engines becomes particularly apparent when looking at the reduced energy requirements coupled with a marked increase in power output per litre for the three M-Class generations since 1997. Comparison of the weight-specific consumption figures (l/100 km per 100 kg) reveals the tremendous development potential of the conventional internal combustion engine. The range for a full tank of fuel on the new M-Class is particularly impressive. This parameter is very important for a vehicle that knows virtually no bounds. Here, the ML 250 BlueTEC 4MATIC – the most economical SUV in its class by far – stands out. With NEDC consumption of 6.0 l/100 km, the frugal diesel engine with the standard 70-litre tank can cover around 1170 kilometres before needing to stop for fuel. If the vehicle is fitted with the optional 93-litre tank, the car can even cover up to 1500 kilometres between refuelling stops. The excellent fuel economy is underpinned by a comprehensive package of BlueEFFICIENCY measures as well as by this state-of-the-art engine technology. In addition to the ECO start/stop function that comes as standard, these measures include the new seven-speed 7G-TRONIC PLUS automatic transmission. Low-friction axle drives, electric steering and tyres with low rolling resistance also play their part in reducing fuel consumption. The re-engineered 7G-TRONIC PLUS, standard on all M-Class models, boasts an integrated ECO start/stop function, even lower converter slip and optimised efficiency. A central role is played by the new torsion damper, which eliminates torsional eccentricities and vibrations in the transmission even more effectively. The lower the rpm and the lower the number of cylinders, the more severe these can be. 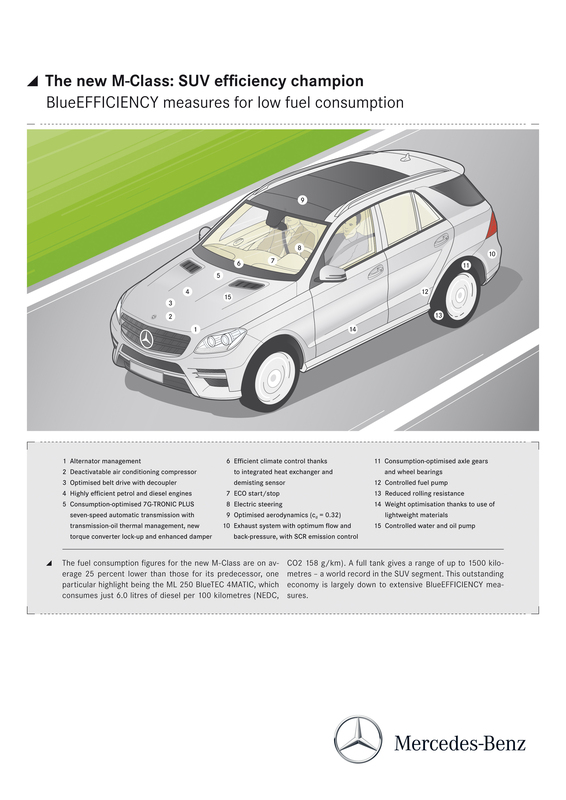 This results in a conflict of aims between comfort and fuel-efficient operation. Mercedes-Benz developers resolved this by using a so-called twin-turbine damper, which is also fitted with a centrifugal pendulum on the diesel models. Depending on the rpm, this moves the centre of mass and allows comfortable operation even in the most economical operating range. Furthermore, the optimised damping allows a marked reduction in the slip of the torque converter lockup clutch even under low loads, which also contributes to fuel savings. In addition, the optimised damping of rotational irregularities and vibrations in the transmission allows an even faster response to driver commands via the accelerator pedal. Friction-optimised bearings and new transmission oil thermal management also help reduce fuel consumption. The optimised belt drive system with decoupler, together with intelligent, on-demand control of all ancillary components and pumps, also helps to reduce the energy requirements of the new M-Class. The oil and water pumps in the engine, as well as the fuel pump in the rear section of the vehicle, are only activated according to actual need. The same control logic is used in the THERMATIC and THERMOTRONIC air conditioning systems. In these, the coolant compressor only runs when necessary. An internal heat exchanger and the sophisticated sensor system including a demisting sensor on the front windscreen ensure optimum efficiency of the air conditioning systems in the interior. A key factor in the diesel engines is also the optimisation that has been undertaken of the flow and counterpressure in the exhaust system with its SCR emission control technology. A consistent use of lightweight construction techniques has enabled the development engineers to keep the weight of the new M-Class on a par with that of its predecessor, despite more equipment. The links on the front and rear axles, for example, along with the bonnet and wings, are made out of light and yet very strong aluminium alloys, while the cross member for the instrument panel is made of magnesium. 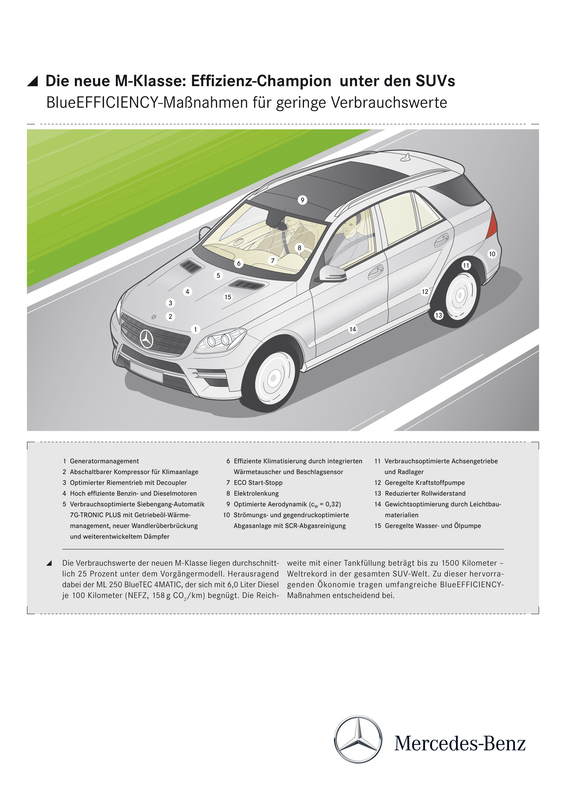 With a drag coefficient, or Cd value, of 0.32, the new M-Class (ML 250 BlueTEC) also sets a new best figure for this vehicle class (total aerodynamic drag Cd x A = 0.92, predecessor 0.94). Painstaking simulations undertaken with the digital prototype, along with final touches added in the wind tunnel, ensure a perfect flow of air around the vehicle. The key factor determining the low wind resistance is the aerodynamic efficiency of the basic bodyshell, including the optimised design of the front bumper with its integrated spoiler, of the A‑pillars and of the roof spoiler, plus numerous other detailed improvements. The "energy-transparent vehicle" development tool, created in-house by Mercedes-Benz, was piloted as part of the M-Class development process. 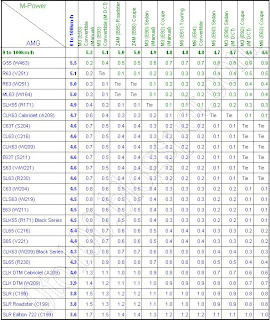 The outstanding opportunities presented by this method, which can detect the possibilities for optimisation in even the most minute component, will be exploited on all new model series in the future. 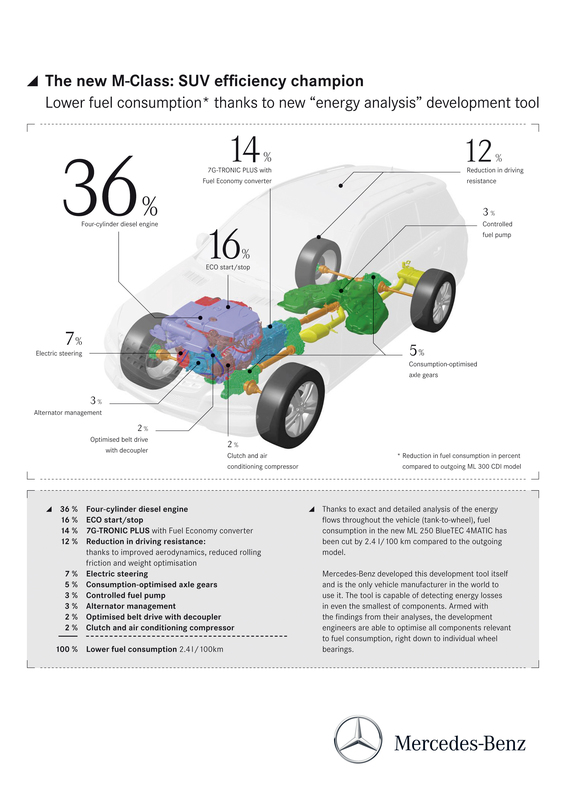 An exact and meticulous examination of the flow of energy throughout the vehicle (tank to wheel) helps the development engineers to optimise every single assembly that has an impact on fuel consumption, right down to individual components, such as wheel bearings. The idea for the "energy-transparent vehicle" stemmed from the failure in the past to verify or demonstrate clearly the many factors affecting consumption and the interaction between fuel-saving measures. Using the "energy-transparent vehicle" tool, the engineers can now detect detailed potential optimisation measures by breaking down energy flows into cause and effect and analysing energy interactions within the entire vehicle. The process draws on complex, highly precise metrology which records some 300 energy-relevant measurement points with a sampling rate of up to 1000 measured values per second. Every minute some 2.4 million measured values are generated, which can subsequently be analysed to reliably pinpoint optimisation potential. The process is complemented by energy simulation models which are validated by means of the measured variables. 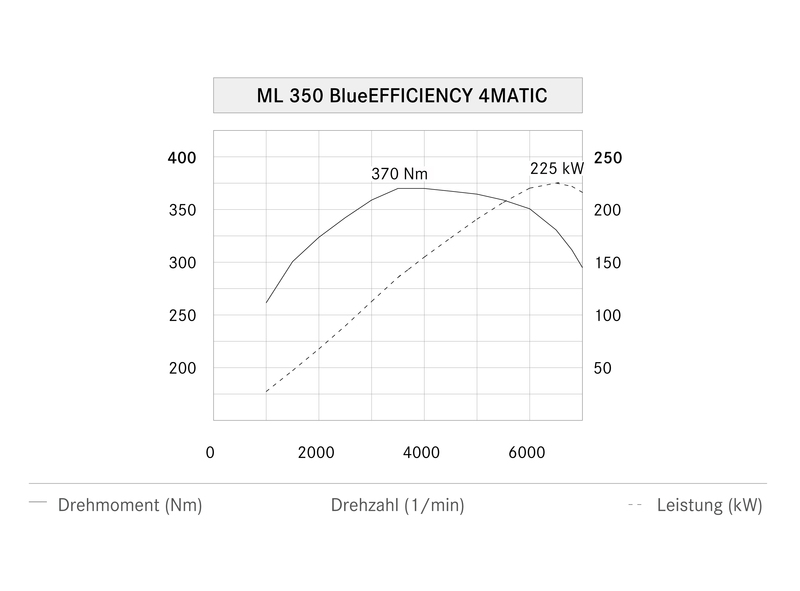 This enables the energy efficiency of individual major assemblies and components as well as the entire vehicle to be analysed and quantified. Once the specialists have identified a vehicle component with energy shortcomings, they team up with the relevant specialist departments to devise solutions. This cooperation focuses on design, or the properties of the materials used in individual vehicle components such as wheel or axle bearings. In addition, modified control strategies can also produce the desired outcome. The "energy-transparent vehicle" process which is exclusive to Daimler enables the development engineers to highlight and leverage optimisation potential both for cars with conventional internal combustion engines as well as hybrid, electric or fuel-cell drives. In future, this process may even give rise to a generally applicable development tool for all machines and help boost energy efficiency across the board. A wide range of applications are conceivable. Whether in industry for power stations, (wind) generators, pumps or conveyor systems, in the home for refrigerators, washing machines, dryers and lawnmowers, or for transportation applications involving ships, trains or planes – the optimisation potential of disparate technologies to save energy could be analysed in detail with the consistent usage of this technique and implementation recommendations made.